Since the appointment of Roberto Martinez, Everton have been on the crest of wave, moving forward with significant pace as they look to break through the self-imposed glass ceiling that permeated the previous regime. The Blues are certainly on the up, Roberto has put his faith in the club’s top class youngsters, adopted a playing style worthy of the school of science and utilised the transfer market skilfully, maximising the clubs resources to produce a team capable of challenging at the top. All of this, combined with some fabulous performances have lifted even the most pessimistic of Evertonians. But the news that was finally confirmed today, was the clearest sign of Everton’s intent. Leighton Baines is staying at Goodison Park, with the Blues having successfully fought of the advances from Old Trafford. The rumours have been all over the internet for the last fortnight, but confirmation that England’s first choice left back had turned his back on the riches of Old Trafford to stay on Merseyside proves once and for all that the playing squad have joined the supporters and bought into the Martinez revolution. Leighton Baines, was one of David Moyes most trusted players during the former managers time at the club and it was no surprise that he immediately set about bringing the former Wigan man with him to the defending Champions. Martinez and the often maligned Bill Kenwright were adamant that Baines was not for sale, but as was the case with Marouane Fellaini, money often talks. Thankfully the clubs hierarchy were true to their word and despite several people close to Baines admitting he was tempted at the thought of playing for United, Everton remained steadfast in their desire to retain the services of the Premier Leagues best full back. Determination to retain a player under contract is one thing, but with only 18 months left on his existing agreement, the Blues knew they would be powerless to keep hold of Baines in the long-term, unless they could convince him his future lay on Merseyside. If you buy into the media fueled frenzy that dictates that anyone half decent has to play for one of four clubs, then you would have expected the inevitable Manchester United press conference this January. 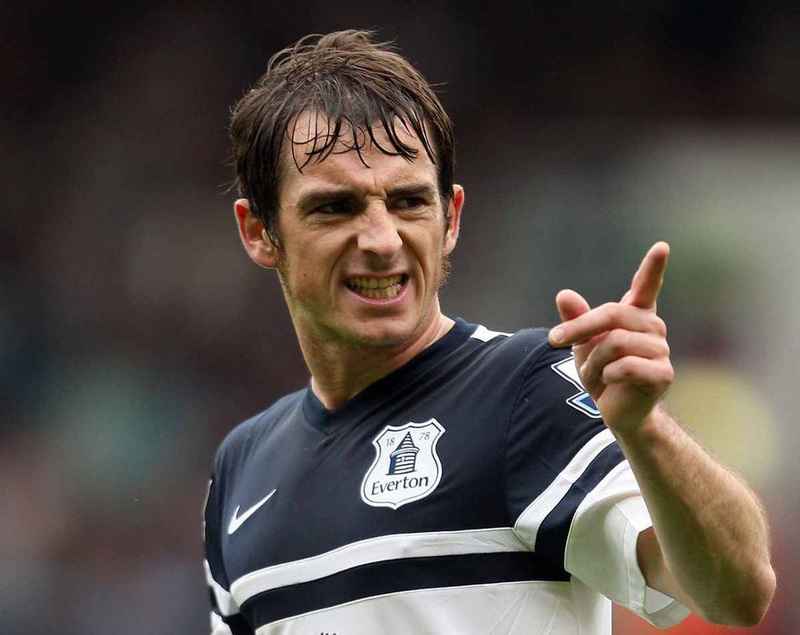 Thankfully we will not be witnessing Leighton Baines holding aloft a Manchester United shirt, instead the coolest man in sport, will calmly and without fuss, put pen to paper on a new four-year deal at Everton. So what changed, what convinced Leighton Baines that his future was Blue? The biggest factor (if we ignore the fact that he is probably now the highest paid player in the history of the club) has to be the unrelenting progress made since Martinez arrived at Goodison. Let us not forget, in the summer, a number of Evertonians joined the press in writing off the Blues chances. This, after all, was a football club that had only survived due to the skillful management of David Moyes. Without the dour Scot at the helm, Everton were destined for a relegation battle. Martinez however, had other ideas and has expertly combined the defensive resilience that was a trademark of the Toffees under Moyes, with a free-flowing style, reminiscent of League winning sides of yesteryear. Martinez has also made Baines a central figure in his plans. Alongside Seamus Coleman, the England number three has unrivaled freedom to push forward and join in with the Blues attacks. The fear factor, that would have led Baines to take on a restricted role at Old Trafford, the Emirates and Stamford Bridge is gone, and tomorrow night, when Everton take to the field at Anfield, the message to Baines will be quite simple, cause Liverpool as many problems as possible. There is also a belief among everyone connect with Everton that the Blues are on the verge of great success. Progress in the FA Cup has been serene so far and although that will not be taken for granted, the players and supporters will already have an eye on going one better than 2009, when they left Wembley heartbroken and with runners-up medals in their pockets. This is also not a club ready to put all their eggs in one basket. Fourth place and Champions League football is a distinct possibility and a win at Anfield will lift the Blues above our local rivals and into that precious fourth position. This is a different Everton, this is a club that is prepared to take on the might of Manchester United both on and off the field. Everton are now a club that can fulfill the ambitions of the best players in England. Leighton Baines is an Evertonian and the clubs loyal supporters will get to enjoy the “wickedest left foot around” for another four years at lest. Previous Post Is Canales already an Evertonian? Next Post Oviedo injury to inspire Blues?